Three known attempts to make a map of x-risks prevention in the field of science exist. http://acritch.com/x-risk-2015/ But its ecosystem ignores organizations which have a different view of the nature of global risks (that is, they share the value of x-risks prevention, but have another world view). 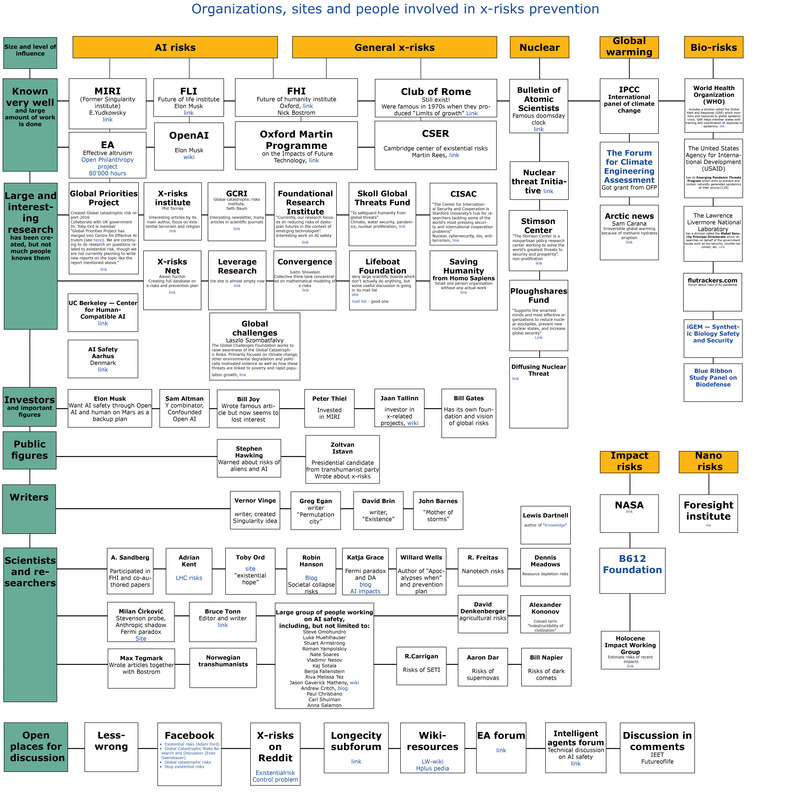 In my map I have tried to add all currently active organizations which share the value of global risks prevention. I used only open sources and public statements to learn about people and organizations, so I can’t provide information on the underlying net of relations. I tried to give all organizations a short description based on its public statement and also my opinion about its activity. In general it seems that all small organizations are focused on their collaboration with larger ones, that is MIRI and FHI, and small organizations tend to ignore each other; this is easily explainable from the social singnaling theory. Another explanation is that larger organizations have a great ability to make contacts. It also appears that there are several organizations with similar goal statements. It looks like the most cooperation exists in the field of AI safety, but most of the structure of this cooperation is not visible to the external viewer, in contrast to Wikipedia, where contributions of all individuals are visible. It seems that the community in general lacks three things: a united internet forum for public discussion, an x-risks wikipedia and an x-risks related scientific journal. Ideally, a forum should be used to brainstorm ideas, a scientific journal to publish the best ideas, peer review them and present them to the outer scientific community, and a wiki to collect results. Currently it seems more like each organization is interested in creating its own research and hoping that someone will read it. Each small organization seems to want to be the only one to present the solutions to global problems and gain full attention from the UN and governments. It raises the problem of noise and rivalry; and also raises the problem of possible incompatible solutions, especially in AI safety.